Description: In this experiment we assess the long-term effects of pollen addition and exclusion on plant fitness. Does swamping a flowering plant with pollen affect its longevity or likelihood of flowering in subsequent years? In 2012 and 2013 we identified flowering E. angustifolia plants in experimental plot 1 and randomly assigned one of two treatments to each: pollen addition or pollen exclusion. In the pollen exclusion treatment, we place pollinator exclusion bags on all flowering heads to eliminate pollinators. 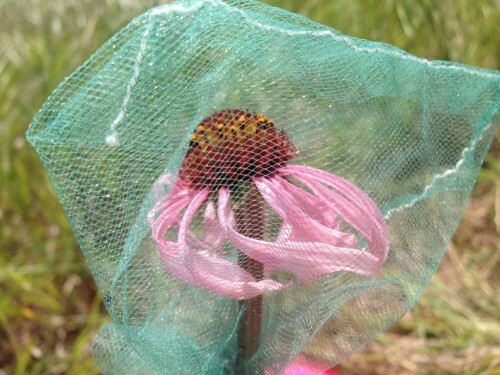 In the pollen addition treatment, we cover heads with pollinator exclusion bags, but we remove bags approximately every three days to apply pollen from several other Echinacea plants on all persisting styles. When plants flower in subsequent years they receive the same treatment they were originally assigned. Team Echinacea members record plant fitness characteristics annually. We process all harvested heads following the same lab protocol as in other experiments. Link to flog posts: Read updates about this experiment on our flog (field blog) as written by Team Echinacea.